Any person in charge knows for sure that there is no employee in the world who is ready to selflessly carry out his or her direct duties at work forgetting about his or her own interests, hobbies, even most harmless or useful. There have always been, are and will always be sluggards out there. Well, probably candid cameras will do the trick? In each office? Hardly. A good boss is certainly aware of «software agents» that are installed on computers and collect visual information about employees' activities. That's what you can present a sluggard as solid proof of his guilt. The program LanAgent is really effective for this purpose. It is a serious argument in the eternal confrontation between a stern boss and crafty employees. And it's not even about catching a careless employee red-handed and withholding his bonuses, but about anticipation, foreseeing such activities. Believe it, once caught, our sluggard will hardly start playing solitaire or surfing the net when the boss is not around. Prevention is the best cure. To begin with, LanAgent is completely invisible (even for users who think of themselves as advanced), yet still it monitors all their activities: logs all programs launched on a certain computer, intercepts visited sites, monitors the clipboard and makes screenshots. This data is sent to the administrator's computer and stored in a database unavailable for other users. Briefly about how LanAgent works. The program consists of two parts: the client part (agent) and the administrator part. 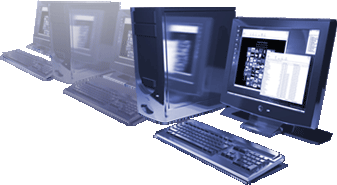 The administrator part is installed on the administrator's computer, while agents are installed on users' computers. Agents monitor all users' activities on each computer and the administrator part collects information over the network (polls agents) for the administrator to be able to view the entire data on his computer and make a report. With the report wizard, you can select the users you want to create a report for, the period to display data for and also the types of logs to include in the report. The report will be created in the HTML format. Keyboard - here you can see information about keystrokes. Keystrokes are logged by the windows of the programs where they were made. The list of windows is in the table. They are sorted by time. At the bottom of the tab you can see the title of the window, the path to the program, the user who worked with it and, of course, all keystrokes. The program can be configured so that it shows only characters while hiding system keys. Screenshots - hidden agents can regularly make screenshots of the entire screen or of the currently active window at the interval specified in the settings. All screenshots are saved to the database together with the time of creation, its window title and username. Thus, the owner of the computer only has to select the record he is interested in and double-click it to see what was happening on his PC. Programs - this tab is used to view information about who and when launched and closed certain programs. Besides, you can see not only the path to the software used, but also the title of its window. Clipboard - as soon as data appears in the clipboard, information about it is logged in the corresponding table. Here you can see in what window the copy operation was carried out and who did it. If you select a record in the table, you will see the content of the clipboard in the lower part of the tab. You should keep in mind that you can log not the entire content of the clipboard, but part of it. To do it, you can specify the maximum amount of information that should be saved. Files and folders - all changes in the file system will also be logged: creating, deleting and renaming files and folders. You can monitor the entire file system or you can specify the folder to be monitored. Computer - this tab is used to view information about who and when switched the computer on and off. Internet connections - all established Internet connections will be logged together with the time when the connections were broken and it will be displayed on this tab. You will also be able to find out what connections were used to connect to the Internet. Visited sites - hidden agents log all sites the user visits. You will be able to see both the link itself and its title. What can you do with log files besides viewing them? You can search them. To do it, select the record to start searching from and enter the string to be searched for. You can perform a case-sensitive search. It is possible to remotely control the settings of agents. The administrator can specify what actions should be logged or at what intervals screenshots should be made without leaving his place. You can remotely start or stop monitoring, send a text message to a user's computer, etc. The administrator part of the program can automatically poll users' computers and get information agents collect at certain predefined intervals. To sum it up, with LanAgent, you can effectively monitor how efficiently employees use their time at work and watch them in real time. However, it is not a good idea to go too far because the purpose of the program is not to catch as many «perpetrators» as possible, but to prevent such actions.